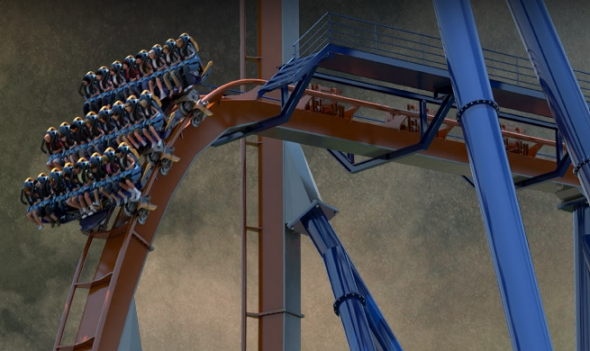 Cedar Point's new roller coaster: Valravn is a "dive coaster." The park’s official announcement caps months of speculation, which early on zeroed in on the addition of an 18th roller coaster at Cedar Point, this one a so-called dive coaster … There are two dive coasters in the United States, both the work of Bolliger & Mabillard, the Swiss firm that is believed to be designing Cedar Point’s new coaster. “Dive coasters” are apparently differentiated from standard coasters by their wide cars and straight-vertical first drops, which come after a stretch of flat track rather than in the hill shape you probably picture when you imagine a roller coaster. In another account, a valravn is described as a peaceless soul in search of redemption that flies by night (but never day) and can only free itself from its animal countenance by consuming the blood of a child. Don’t mess with a valravn!